Racing partners wanted no entry cost. 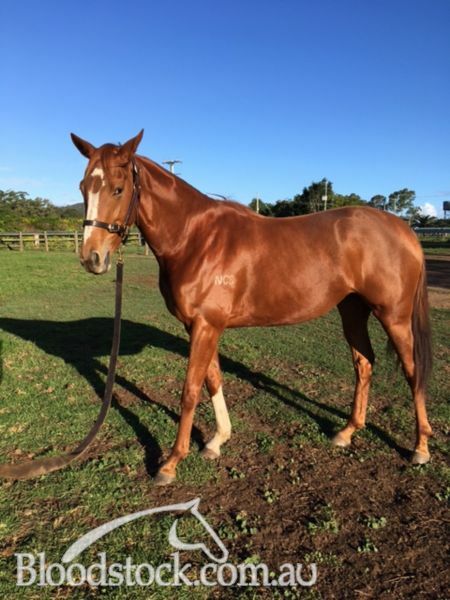 Given time to mature this mare is now ready to start her career. 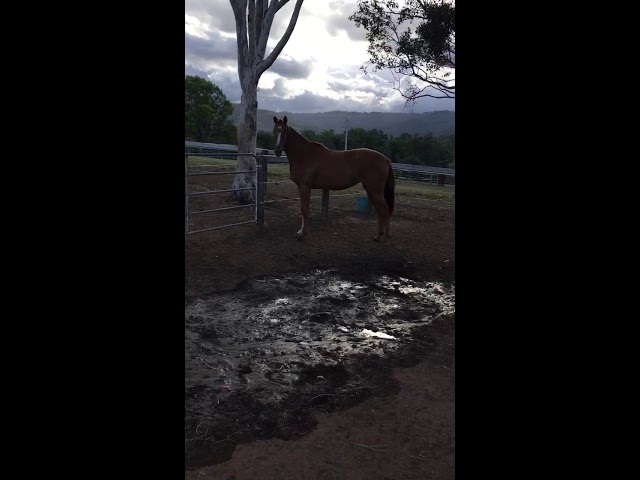 She was broken in and given a short preparation then put in the paddock to grow and strengthen. 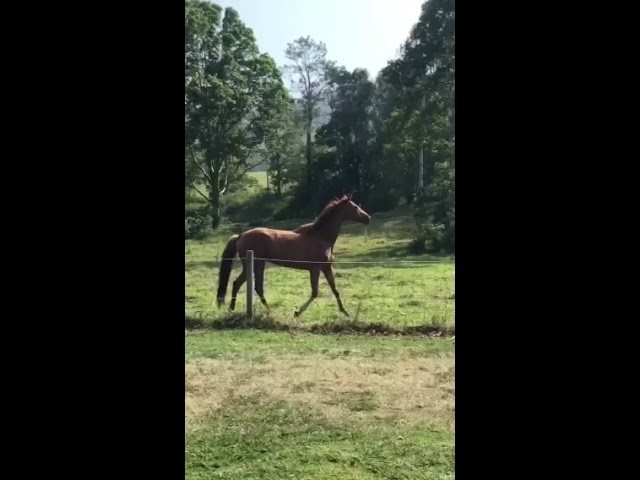 She is a great moving mare with a strong powerful action. Her full brother is the five time winner Wicked Investment with placings in the city and a win at Provincial level. 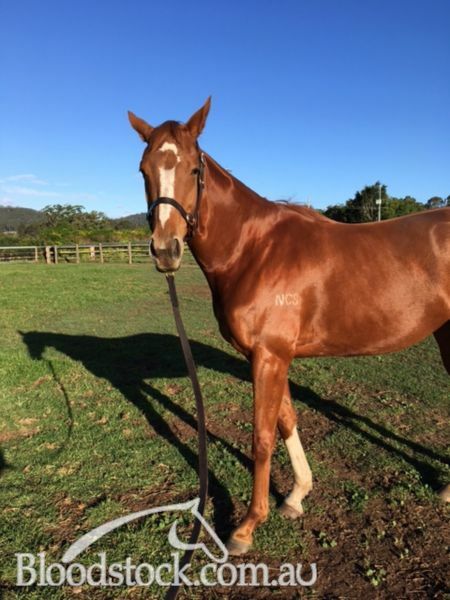 She will be trained at Corbould Park on the Sunshine Coast. Owners get all race day privileges of free entry to races and members stand. 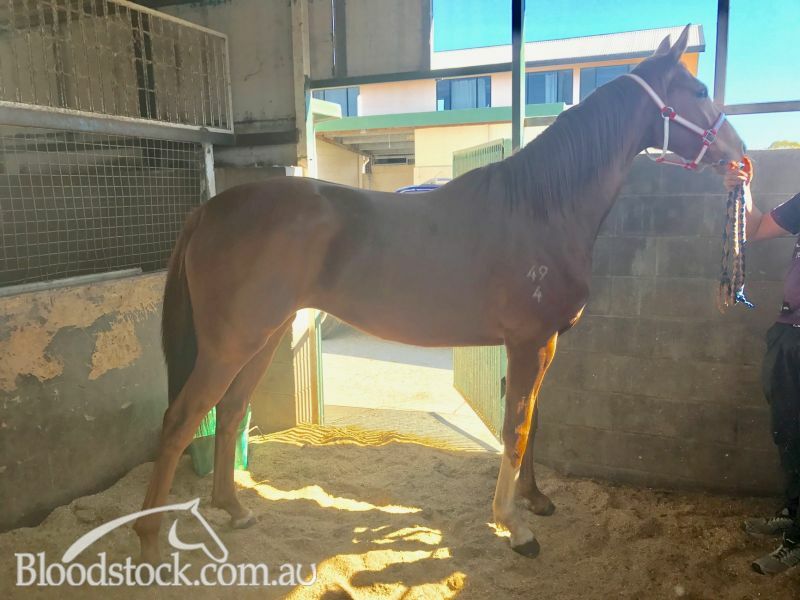 There is no better way to get into the ownership of a race horse and enjoy the excitement and socialising that comes with it. WICKED STYLE (USA) (Chestnut 2005-Stud 2010). 5 wins-3 at 2, Keeneland Breeders' Futurity, Gr.1. Sire of 115 rnrs, 59 wnrs, inc. SW Epic Grey (Pinjarra RC Magic Millions WA 3YO Trophy, RL, Wicked Intent, SP Star of Night and of Hit Snooze, Wicked Ways - Utopia Life (H.K. ), Stylish Criminal, Gracefully Chic, Wicked Snippets, A Bit Wicked, Fashion App, Gothic Might, Tiburon, Wicked Temptation, We'll Beat It, Wicked Express, The Wicked Witch, etc. Piggy Bank (g by Ferocity) 3 wins at 1200m, 1300m, BRC Burrandowan Picnic Race Club H., XXXX Gold H., 3d SCTC Kerrod Walters Brightaire H.
Wicked Investment (g by Wicked Style (USA)) 5 wins to 1400m, A$81,050, to 2018-19, 3d BRC Tacoma Plumbing 2YO H., Tiland Constructions Pty Ltd 2YO H.
City Savvy (g by Ferocity) Winner at 1200m in Aust. 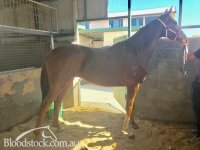 Kitty Softpaws (f by Wicked Style (USA)) Placed to 2017-18 in Aust. 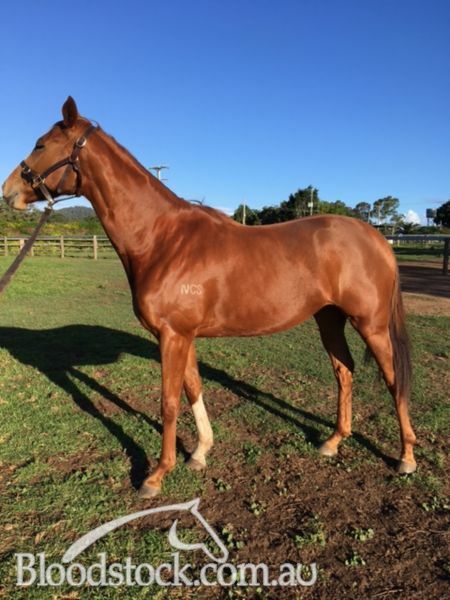 Vaudeville (f by Pure Theatre) Placed in Aust. HOT JULES (c Bletchley Park) 3 wins-2 at 2-from 1100m to 2400m, A$218,700, WATC Derby, Gr.1, WATC Linfield H., Heliolight 2YO H., 2d WATC Belgravia S., L, Meteorite 2YO H., Alethea H., 3d WATC JC Roberts S., Gr.3, TJ Smith Trophy, L, Lindsay Rosenthal S., L, Fairetha S., L, 4th WATC Challenge S., L.
YURO (g Fusaichi Pegasus) 3 wins from 1200m to 2200m, A$248,600, WATC Sir Ernest Lee-Steere Classic S., Gr.3, Melvista S., L, 2d WATC Derby, Gr.1, 3d WATC JC Roberts S., L, 4th WATC TJ Smith Trophy, L.
SPIRIT OF JULES (c Bletchley Park) 4 wins-1 at 2-at 1200m, 2000m, A$104,115, WATC Dayana S., L, Pantheist 2YO H., Universal Prince H., All Legal H., 2d WATC Sandringham 2YO H., Tuscany 3YO Quality H., Seppelt Fleur de Lys H., Selangor Turf Club Trophy H., Sattler's H., Swans 2YO H., 3d WATC Healthway 2YO H., Paddy Hannan's H., Southcorp Wines H., York Beverley H., Don Martin H.
Swift Spice (c Bletchley Park) 9 wins from 1200m to 1650m, A$165,825, WATC Williamson Welter H., EDP Hayes H., Royal Khora H., Sands Print Group H., Starglow H., Lucky Escape H., Coca-Cola Family Day Welter H., 2d WATC Murray H., Catch a King Welter H., Miss Italy Quest H., Tomito H., 3d WATC Grandstand Cup, L, Cadenas Welter H., EDP Hayes H., AH Jordan H., 4th Bunbury S., L.
Atas Semua. 2 wins at 1200m in Malaysia. Blue Boy. 2 wins at 1000m, 1100m, Singapore TC Benchmark 48 H., Benchmark 53 H.
Spyro the Dragon. Winner at 1200m in Singapore. Veganox. 5 wins to 1500m, WATC First Lady H., 2d WATC Dawdie H., Jetabout H.
Hot Spice. Winner. See above. CLEAR DAY (c Zamazaan) 12 wins from 1800m to 2600m, A$96,235, Moonee Valley Cup, STC Winter Cup, AJC Rosebery Welter H., Chester Hill H., STC Baulkham Hills H., 2d STC Lord Mayor's Cup, 3d AJC Metropolitan H., SAJC Adelaide Cup, Sydney Turf Club Cup, STC Winter Cup. FINALLY (f Snaadee) 7 wins from 1200m to 1600m in U.S.A. and NZ, Otago RC Dunedin Guineas, L, CJC Canterbury Belle S., L. Producer. EMIT TIME (g Gilded Time) 7 wins-2 at 2-to 1200m, A$334,500, 277,470Rgt. in Aust. and Malaysia, Perak TC Sultan Gold Vase, L, 2d GCTC Magic Millions 2YO Classic S., RL. BURN OFF (f Krupt) 3 wins-1 at 2-from 1050m to 1800m, A$123,705, to 2018-19, SAJC Hill Smith S., L, Barrister Block Wines 2YO P.